A hiatal hernia occurs when a portion of your stomach pushes up through your diaphragm's small opening, the hiatus, which is responsible for allowing the esophagus to pass through to the stomach. When a hiatal hernia occurs, the hiatus cannot close properly and stomach acid travels back to the esophagus. This causes heartburn, inflammation, ulcers in the esophagus and stomach spasms. Exercise is one of many options, like medications, used to treat symptoms of hiatal hernias. Unfortunately, the wrong types of exercise can make the hernia worse. According to MayoClinic.com, most people don't know they have a hiatal hernia unless symptoms like heartburn are present. 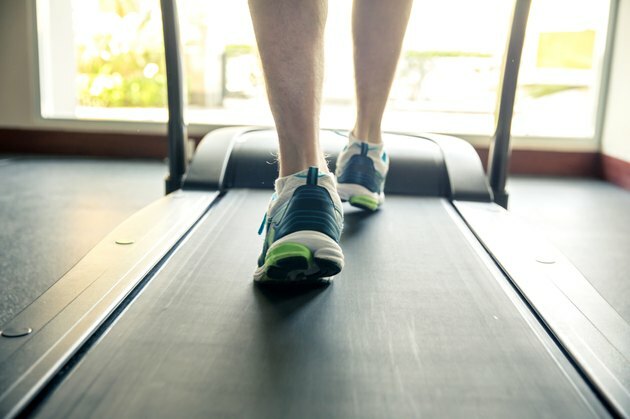 Exercise can be used to treat hiatal hernia symptoms, along with other methods like medication and surgery in extreme cases. Exercises to strengthen the abdominal muscles and the diaphragm will sooth hiatal hernia symptoms and assist in preventing future reoccurrences. Additionally, cardio exercises like walking will help in losing excess weight, another potential cause of hiatal hernias. Weak abdominal muscles is also cause for hiatal hernias. The pelvic thrust is a simple and safe abdominal exercise to strengthen abdominal muscles. Lie on your back on the floor with your knees slightly bent and your feet flat on the floor. Press your feet into the floor and lift your lower back and bottom upwards while you keep your upper back and shoulders pressed against the floor. Pause at the top of the movement, then slowly lower to the starting position. Do 15 to 20 repetitions. Breathing exercises can be used to strengthen the diaphragm, which may prevent further hiatal hernia re-occurrences and be used for relaxation. Relaxation can aid in relieving symptoms that might stem from physical or emotional stress, according to Dr. Ben Kim. A breathing exercise to do at home is to lay flat on a floor on your back. Take a deep breath so that your lungs are full and your chest has expanded. Tighten your abdominal muscles and then blow out the air though your mouth, making sure your lips are slightly opened so that you have to force the air out as you blow. Taking deep breaths and blowing out will also improve the health of your lungs in addition to strengthening your diaphragm and relaxing the body. Though some exercises help a hiatal hernia, some can worsen the condition, such as exercises that increase pressure on the upper abdominal area. According to RefluxRemedy.com, exercises likes somersaults, pushups and crunches, and weight training moves likes squats and deadlifts, place an increased amount of pressure on the upper abdominal area which could cause the hernia to worsen. In severe cases, individuals may need surgery to treat a hiatal hernia.